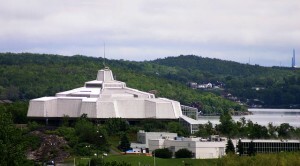 This year marks the 30th anniversary of Science North in Sudbury, Ontario. The establishment of Science North is deeply rooted in the Sudbury community and represents a truly Northern approach to establishing a science centre. From the mid-1950s to the 1970s prominent community members in the Sudbury area were advocating for the establishment of a mining museum. Locally a shift occurred in the late 1970s when the community support moved toward the idea of a general science centre instead of an institution dedicated solely to geology or mining. A large investment by Inco Limited in 1981 helped launch dreams of a science centre into a reality. This $5 million dollar capital donation to the project was the largest single corporate donation to a community project in Canada at the time. Following Inco’s donation other community organizations, individuals, and levels of government began to support the project. Science North opened to the public on June 19, 1984 and was officially opened by Queen Elizabeth II and Prince Philip on October 4, 1984. A summary of the Queen’s visit and an overview of some of the early exhibits at Science North can be seen here (PDF). In addition to the idea of celebrating local mining Science North was seen as an opportunity to diversify the economy of Sudbury. The late 1970s and early 1980s had seen a number of mining strikes that had impacted huge portions of the community. Science North was viewed as a way to mend the relationship between Inco and community members while simultaneously attracting tourists and building something that the community could be proud of. Those involved with planning of Science North realized early on that creating a mini-version of the Ontario Science Centre in Toronto wasn’t the way to inspire community support or create a viable tourist attraction. Science North was designed by Raymond Moriyama who also designed the Ontario Science Centre. But the architecture of Science North is unique and reflects its location in Northern Ontario. The building is comprised of two large hexagonal shapes placed on top of a rock crater. From above the connected hexagons look like a large snowflake. The architecture of the building reflects the geological history of the Sudbury Basin and the glacial past of the area. Science North has been a pioneer in its approach to management and interpretation of exhibits at a science centre. From its inception the organization has been firmly committed to making science accessible and placing an emphasis on human interaction. Science North pioneered the idea of “bluecoats” or front line staff dedicated to interacting with patrons. According project manager Dave Pearson, the original reason for the bluecoats was that the fourth floor of exhibits wasn’t completed at the time of opening. In an attempt to hide the incomplete nature of the floor they placed lots of staff in the area to talk to visitors and start conversations about science. The bluecoats have become a well-known part of Science North and are a model that has been replicated in science centres around the world. 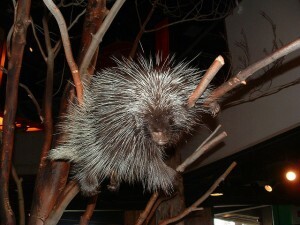 Quillan the Science North porcupine, part of the Northern Forests exhibit. Science North also has a long history of community outreach and Northern Ontario focused programming. For example, the Northern Garden, the Fossil Table, Legends of the Great Lakes, Arctic Voices, and the Vale Cavern all northern focused in their programming and design. The main pathway to the exhibit area at Science North takes visitors through a tunnel cut into a naturally occurring rock formation. The exposed rock that makes up the walkway speaks to the geological past of Sudbury and Science North’s connection to its location in Northern Ontario. Science North has also strived to extend its community outreach beyond Sudbury. There is a Science North satellite location in Thunder Bay that has an emphasis on education programming. The organization also offers summer science camps in 28 communities across Northern Ontario. The off-site science camp program has been running since 1987 and involves children from communities of all sizes. The summer camp service is a boon to smaller communities that don’t have the resources or population size to operate their own summer day camps. Additionally the Science en Route Outreach Program travels to schools and communities to bring science to students who live in Northern Ontario. All of these outreach programs have helped connect Science North to communities across Northern Ontario and highlight the community invested nature of the organization. The 2011 census listed Greater Sudbury as having a population of 160,274 people, making it the 29th largest municipality in Canada. Despite numerous cities being more populated Science North is Canada’s second largest science centre. The organization is deeply invested in its local community and has become a point of pride for many Northern Ontario residents. This community driven project originally designed to teach the public about mining has been transformed into an institution dedicated to generating conversations and community interest in science.